Vegetarian coconut rice is a flavorful side dish that can be eaten on its own as a simple side dish for an Indian food or Thai or pan-Asian themed meal, or, make this easy coconut rice instead of plain steamed white rice to pair with a stir-fry or any kind of sauce such as a vegetarian curry or an Indian lentil dal. Variations of coconut rice are enjoyed all over Asia, where coconuts are in abundance, from Indonesia to India; even some Caribbean cultures have a traditional version of rice cooked with coconut milk. In this recipe, the coconut and lemongrass flavors are inspired by traditional Thai coconut rice recipes, yet this vegan dish has very few ingredients and is a breeze to prepare. Omit the lemongrass stalks if you can't find them locally or they are too expensive. They impart a nice extra Thai flavor, but they certainly aren't needed for a delicious dish. Similarly, use Thai jasmine rice which is a brightly colored and lightly scented white rice, if you can find it, and if not, any variation of plain white rice will work just fine. Use whatever you have on hand. Looking for more vegetarian rice recipes? You can find many more vegetarian rice recipes right here on TheSpruce, including vegetable fried rice, Asian rice salad, curried rice and lentils, or, perhaps it's a few vegetarian Spanish rice paella recipes or vegetarian risotto recipes that you're looking for. If you're cooking on a budget (and even if you're not) and you're looking for more ways to make rice and beans, here's 8 completely non-boring ways to make rice and beans, including brown rice with pineapple, Cuban black rice and beans, rice soup, and more. First, in a large frying pan or skillet over medium heat, sautee the diced onion in the oil for about 3-5 minutes or until the onion starts to turn translucent. Next, add in the rice and lemongrass and cook for about two minutes, until rice is toasted, stirring frequently just to gently toast the rice without letting it burn. You might need to add a tiny bit more oil at this step. Next, carefully add the two and a half cups of water to the rice. Bring the water to a boil, then reduce the heat to medium low, and cover the skillet. Allow your rice to cook, for about 15 minutes, and continue to stir occasionally as it cooks. After fifteen minutes, add in the coconut milk and then allow the rice to cook for about 10-15 more minutes, until the rice is fully cooked through. Be sure to remove the lemongrass stalks from the rice before serving. 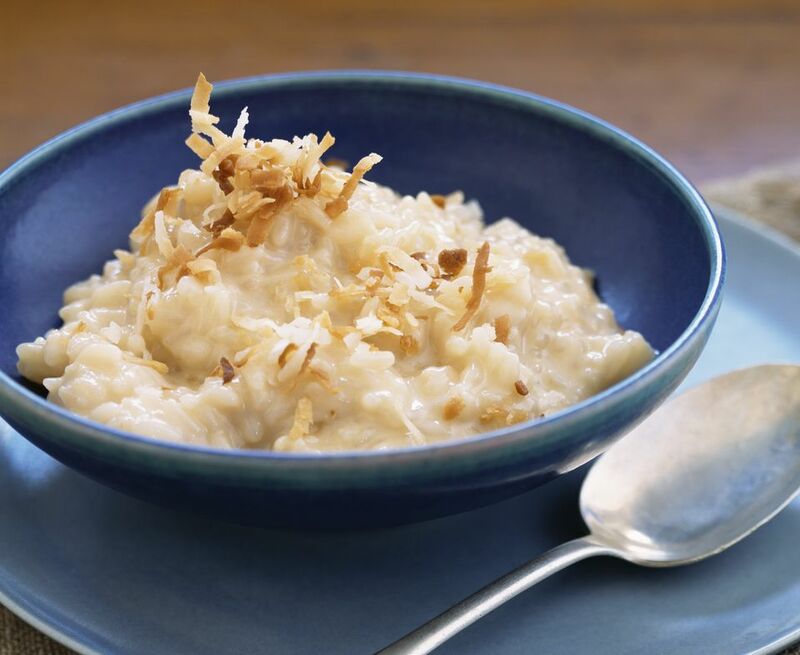 Top with lightly toasted coconut flakes, if you'd like, and enjoy your homemade coconut rice! Now, wasn't that super easy?